well as custom Customer Relationship Management (CRM) software for medical device manufacturer, Oncura. Oncura specializes in cutting-edge treatments – brachytherapy and cryotherapy – for prostate cancer and renal cancer. Their work has revolutionized the use of minimally invasive cryotherapy to treat prostate cancer: in 2006, they wanted to introduce their high-tech fourth generation cryoablation system known as Presice™. This system is capable of using one ultrathin cryoneedle to target cancerous areas while comprehensively monitoring the progress of the minimally invasive surgery. 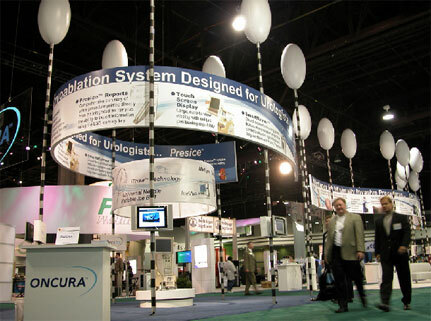 Oncura™ wanted to present Presice™ at the American Urological Association (AUA)’s trade show which took place May 20 –25, 2006 at the Georgia World Congress Center in Atlanta. Their audience comprised urologists and other medical professionals who practice, research, or teach. With three separate but adjacent trade show spaces, Oncura knew they would be in direct competition with another company for the attention of a highly-critical audience who wanted to see the next step in the evolution of cryoablation technology. Oncura had previously talked with other trade show display designers, but found their trade show design concepts as well as their projected timelines and budgets unacceptable. Oncura turned to Dynamic Digital Advertising for something better. Oncura, however, came to Dynamic Digital Advertising on April 3, 2006, giving DDA a limited budget and less than seven weeks to develop a concept and turn it into reality. DDA presented Oncura with a trade show display design concept which would eventually grow to become the most dynamic and radical design at the AUA trade show. Relying on the skills of in-house graphic designers, marketers, medical copywriters, and videographers who composed the trade show planning team, DDA was able to present a trade show design concept that could be developed, built, and installed by the necessary deadline and for less than half of what other trade show design companies were quoting. Oncura’s trade show display was to occupy three separate but adjacent exhibit spaces, which totaled 3,800 square feet. In addition to debuting Presice™, Oncura wanted to present the currently-used SeedNet Gold™ third generation cryoablation system as well as a radiation treatment known as brachytherapy. The challenge to the DDA graphic designers was to create a cohesive design that linked all three spaces and that placed an emphasis on Presice™ without detracting from the other two treatments. DDA’s radical trade show design resolved this potential problem by featuring twenty-five cryoneedles measuring 21-ft tall and topped off with 5-ft iceballs, a series of lightweight, serpentine, modular, laminated tradeshow banners, and carpets with serpentine patterns that matched the banner and Oncura’s blue and white corporate colors. The 20ft x 30ft display trade show exhibit featured two concentric circular banners which detailed the many benefits of the Presice™ cryoablation system. The machine itself was presented on a rotating platform that allowed passers-by to see the new systems and that invited them to enter Oncura’s display area for a closer look. The 20ft x 60ft display featured 17 LCD screens that continuously aired a video that was shot, animated, edited, and produced by Dynamic Digital Advertising. The serpentine banner that ran overhead featured milestones in cryotherapy and mirrored the pattern of the blue and white carpet that was placed beneath it. White leather sofas were placed around the screens as well as in two demonstration areas. The first area presented Oncura’s brachytherapy system, while the second offered continuous demonstrations of the current SeedNet Gold™ cryotherapy system. The 40ft x 50ft booth provided two demonstration areas where Oncura’s experts continuously ran demonstrations with the two Presice™ systems located in opposite carpet-delineated circles. The banner that ran overhead combined facts on the history of cryotherapy along with product introduction information. In the middle, a coffee bar allowed trade show attendees to comfortably observe a demonstration. For the comfort of the AUA audience, more white leather sofas were arranged around the demonstration areas. Among all three display areas were reception desks featuring Oncura’s corporate logo. On each desk were machines in which users would scan a trade show ID card. Any one of the seven machines could capture the user’s name and contact information which provided Oncura with organized, valuable feedback about who was visiting their trade show display. The result of the entire trade show display’s continuous design was an inviting, open-air atmosphere. Traditional trade show booth designs tend to have tight, closed-in, walled spaces that can accommodate only a small number of people comfortably. Dynamic Digital Advertising’s radical trade show display lifted all elements off the ground and allowed attendees to focus on the new product introduction and to move freely in and out of Oncura’s displays, which meant more people were able to observe the function and benefits of the Presice™ system. As an added benefit, Dynamic Digital Advertising also designed a modular format for the banners. Both light-weight and laminated, these sturdy banners can be taken apart and reassembled in many different shapes and configurations to accommodate booths of different sizes and dimensions at future trade shows for years to come. As radical as Dynamic Digital Advertisings complete trade show design, development, and management process is even more so is DDAs approach to professional website design and development. A leading custom website design and development company, Dynamic Digital Advertising has pioneered a revolutionary website design and development process of fourteen individual steps. Each one of these steps has been engineered to accomplish a specific goal; any website design process which does achieve all of these goals will ultimately fail. But with DDAs search engine optimization methodologies, visitor conversion mechanisms, and more, your website is sure to succeed. One of the reasons why Dynamic Digital Advertising can create top-of-the-line trade show displays is our graphic design services. We are a leading graphic design firm, granting clients, based anywhere in the country, access to one of the most comprehensive graphic design service lines available. 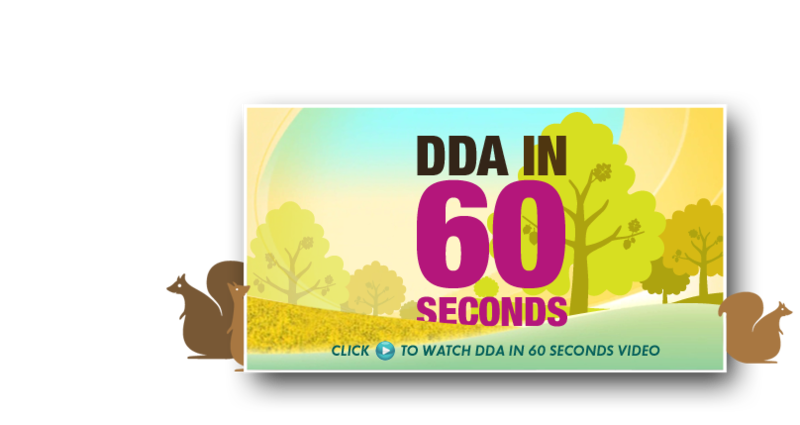 Whether you need digital video animation and virtual reality or large format graphic design for billboards and truck sides, DDA can provide the right imagery for marketing, promoting, branding, and selling your companys products, services, and image.